What’s goin’ down: Kenny, the drug-addicted teen we met way back in the first episode, is locked up in a rehab facility against his will. His sister contacts Hanson, saying Kenny is being abused and mistreated by the people who run the place. Here’s Hanson: Hanson tries the appropriate, legal ways to help Kenny, only to run into dead ends. So of course he goes in undercover, illegally this time, as a troubled youth. 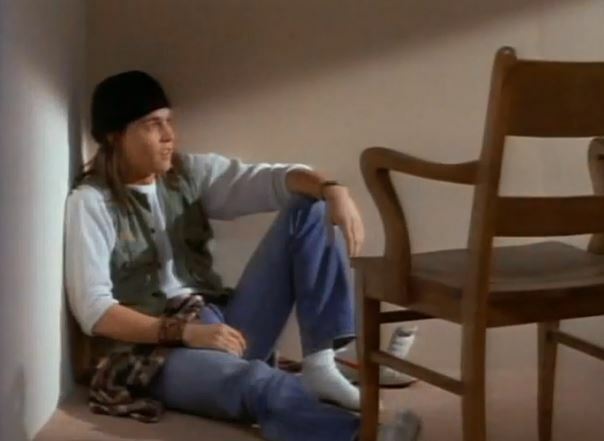 Penhall’s prerogatives: At first, Penhall covers for Hanson’s absence, but after Hanson turns up missing for several days, the Jump Street cops rally to find him. Undercover blues: At first, it appears that nothing is up at the rehab place. Then, the unthinkable happens – Kenny dies while trying to escape, and the management tries to cover it up. Hanson is tranquilized out of his mind for stirring up trouble, leaving his fellow cops to find him and get him out. Torn from today’s headlines: The episode’s title refers to a bestselling self-help book I’m OK, You’re OK, by Thomas A. Harris, which took complex psychiatric practices and made them accessible for the “everyman” reader. Hanon’s T-shirt in this episode sports a Robin Trower logo, referencing a popular English guitarist, who is often compared to Jimi Hendrix. Trivia time: Christina Applegate of Married With Children plays a horny girl inside the rehab center, who puts the moves on Hanson. This is the second time characters from the pilot have resurfaced, after “You Ought To Be In Jail” earlier this season. Hanson’s back together with his girlfriend Amy, the social worker. She’s not seen on screen, but is mentioned several times. The last time we saw her was four episodes back, in the Christmas show. Jumpin’ or not? Once again, here we have the creators taking risks. The episode begins simply enough, with Hanson transitioning from good cop to bad boy to get the job done. But then it goes into unexpected territory by actually killing off the kid he’s trying to save, which I did not see coming. Then, it ends on an ambiguous note, leaving us to question the right or wrong of Hanson’s actions. Intriguing stuff. It’s jumpin’.